Astronomy Software is a vast spectrum, which provides everything from simple mapping software (relative positions of the solar system), through detailed observation planning software to first-person planetarium software. I used several free astronomy programs for producing sky maps. They simulate a view or the stars as if the observer is looking at the horizon. They display the sun, moon, and major planets. They display or hide planet names or symbols. They display or hide constellation names. They display or hide names or designations of the brighter stars. They display deep space objects, e.g. Andromeda galaxy. They can vary the space time coordinates of the observer. They can zoom in on sections of the sky. It’s difficult for me to decide between the three contenders for the top spot. You can decide the best for your purposes according to your needs. Aladin works as an astronomy browser. Instead of the internet, it browses through astronomy images, density maps, and other astronomy sources, e.g. Hubble images, the Simbad database, and the VizieR service. Here you select the item you wish to view and it automatically downloads a view of the item selected.This program provides access to professional quality telescope images in several wavelengths. In effect you are looking through a very large telescope. The images are downloaded from the internet so some displays take a few seconds to update—your results would depend of course on the connection speed and on how many databases are being utilized. One can apparently download files for offline viewing.You can superimpose various views in to one and open up to 16 panels with images in each. . You can bookmark views. You can also point at a specific location using the right ascension and declination coordinate.It was one of only two programs which indexed every star and deep space object in my test sample as well as showing several images of each item. It requires Java 1.5 and runs under Windows, Linux, and Mac.Since Aladin is a sky atlas image viewer and not a planetarium program it has no solar system objects in its index. Obviously there could be images of the solar objects in many of these images but it’s beyond my ability to locate them. Sky-Map.org is also known as WikiSky. It requires an Internet connection and browser.It is an online viewer utilizing your browser. The images here are in color and come from several sources, e.g. DSS2 all Sky Survey, IRAS Infrared Sky Survey, and user uploaded photos.The index also found every star and deep space object in my test sample. Oddly it also indexed the location of the planets but no images were available. Cartes du Ciel is also known as Skychart.It is a very easy to use planetarium program. Its in depth index found every object in my test sample with the exception of UGC 9128. Additional catalogs for stars down to magnitude 16 (UCAC3) are available on the website, along with several specialty catalogs. Cartes du Ciel has a calendar calculating ephemerides for twilight, planets, sun, moon, comets, asteroids, and solar and lunar eclipses between any two dates. And there is a variable star observer with the predictions of minima and maxima for many variable stars for the next couple of cycles.There are instructions for adding the entire PPMXL catalog (magnitude 20), it required 148 GB of hard disk and 24 GB of ram. It requires Windows, Linux, and Mac versions.The program includes images of many deep space objects right in the planetarium window. I didn’t notice any actual stellar images or planetary images. However, the online documentation indicates that planetary images are available in the Linux version. No bookmarks. Computer Aided Astronomy is also known as C2A. It was also fairly easy to use. Its index is second only to Cartes du Ciel in thoroughness. There are several additional catalogs for download. Computer Aided Astronomy has an ephemeris generator which can generate tables for the sun, planets, moon, comets, and asteroids between any two dates. There are tools to generate trajectories of planets, asteroids, and comets between any two dates. One tool shows the moon phases for the entire month. The Ecliptic View tool displays an animated view of the solar system with comets and asteroids. It provides the data section to the left of the planetarium window with the details about the object on display. It also provides the ability to move forward or back through recent views and the ability to bookmark views.There are a lot of images included with the program. Unlike several of the other planetarium programs the images are viewed through a separate window in the image browser. If there is an internet connection, the program can download images from either the ESO or the STScl sky surveys for display in either the image viewer or directly in the planetarium field of view.Computer Aided Astronomy can control a computerized telescope mount.It only works on Windows . Stellarium creates fairly realistic views of the sky. The basic program has over 600,000 stars (roughly up to magnitude 9.9) with another 240 million available as add-ons. This is the only free program that shows constellation groupings for other cultures. Stellarium provides many visual effects, including the Milky Way, twinkling stars, shooting stars, clouds, and light pollution. Several landscapes are included. Its catalog is weak in comets and asteroids.The zoom in shows actual images of planets and some deep space objects.The telescope control plug in allows Stellarium to control a computerized telescope. The Satellites plug in calculates and renders satellites in Earth orbit from NORAD/TLE data.It requires Windows, Linux, and Mac versions. 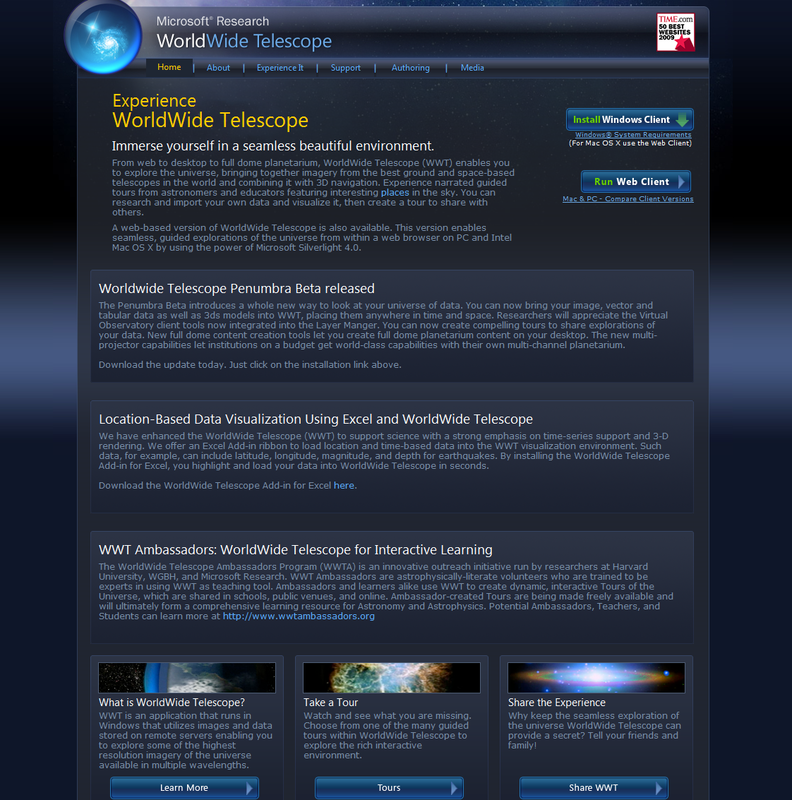 WorldWide Telescope comes in two versions, Windows Client and Web Client. Both versions are very similar and work equally well. If connected to the Internet the Windows client automatically downloads images that aren’t already in the catalog. Its catalog is weak in comets, asteroids, and planetary moons, e.g. only Jupiter shows moons. The Windows Client version can control a computerized telescope. Home Planet excels at locating artificial satellites, comets, and asteroids. There are 256,000 stars in its catalog. Planetary moons such as Titan aren’t shown. Home Planet is portable.The display isn’t as realistic as others. The default sky display is a sky map display, e.g. as a circle with straight up as the center and the horizon as the circumference. There are smaller displays centered on the horizon and a telescope zoom window. There are no images. Solar system objects are indicated by symbols.